This has been a busy week of meetings in Tibet and Nepal preparing for our 2016 Himalayan expeditions. Yesterday, 4 of us just returned from Tibet, where we met with Tibetan government mountaineering authorities, to plan our April, May, September, and October climbs of Everest, North-Col, Shishapangma, Cho Oyu, and treks. The Tibetans are welcoming us to return with open arms. Today, here in Kathmandu, we had a series of long meetings in Kathmandu with the Nepal government mountaineering office and everything is set for our Everest, Lhotse, Camp 3 Training, Everest Glacier School, Island Peak and treks! The Tibet side of Everest has the best views, much better than the Nepal side of Everest. Here is what it looked like today from Everest Basecamp Tibet! Nuptse, Everest, and Lhotse seen from our Airbus on the flight from Kathmandu to Lhasa. Monika Witkowska climbing a ladder in the icefall. 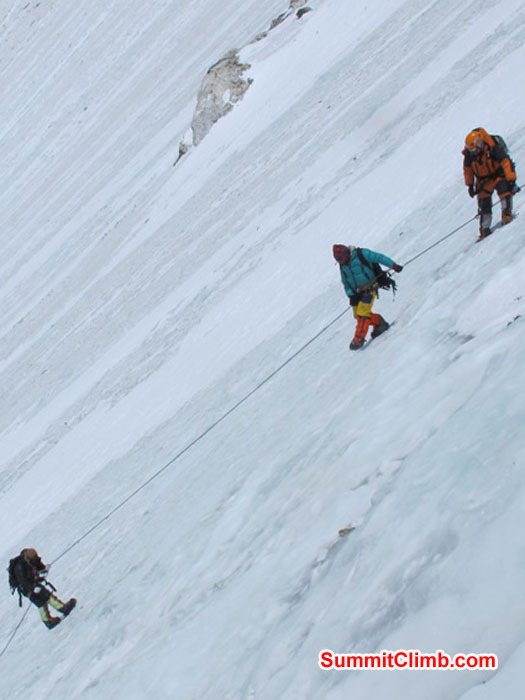 Team climbing the steep Lhotse face to camp 3 at 7000 metres - 23,000 feet. Monika Witkowska Photo. Violetta Pontinen Photo. Monika Witkowska on the summit. Photo by Kieran Lally. Tent at North Col with route to Camp 2 seen up snowfield and Everest summit in upper right - Photo Mia Graeffe. 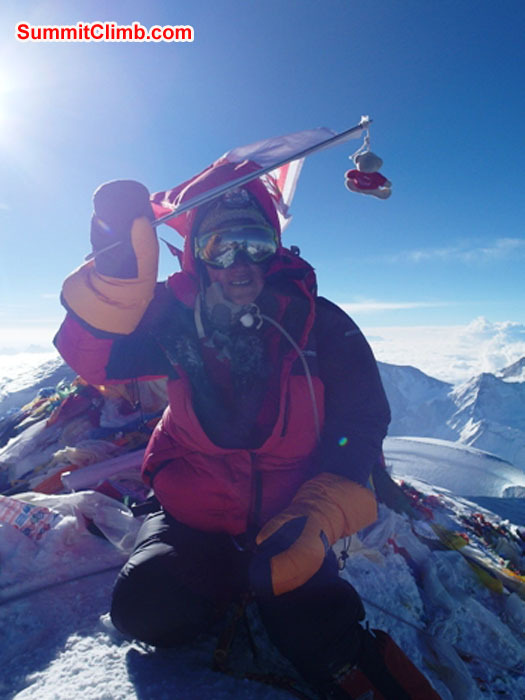 Mia Graeffe on Summit of Everest - First Female from Finland to summit Everest from Tibet - Photo Mia Graeffe. Ancient Rongbuk Monastery in front of Everest. Marker commemorating Everest Elevation measurement in Base Camp. 7 Feb - Today's Update from Leader Dan Mazur : Meeting Nepal Mountain Dept. Free permit in works. Previous mtn exp NOT required. Lowest age to be 16. NO upper age limit! Section Officer, Dan Mazur, and Gyanendra discuss Everest expedition procedures on the rooftop at Department of Mountaineering. well dressed and friendly Nepal Army foot soldiers escorted us from the airport. Real gentleman, they tipped their caps to us! Murari Sharma, SummitClimb's office director, points out the signs for the Mountaineering Offices of the Nepal Governemnt. 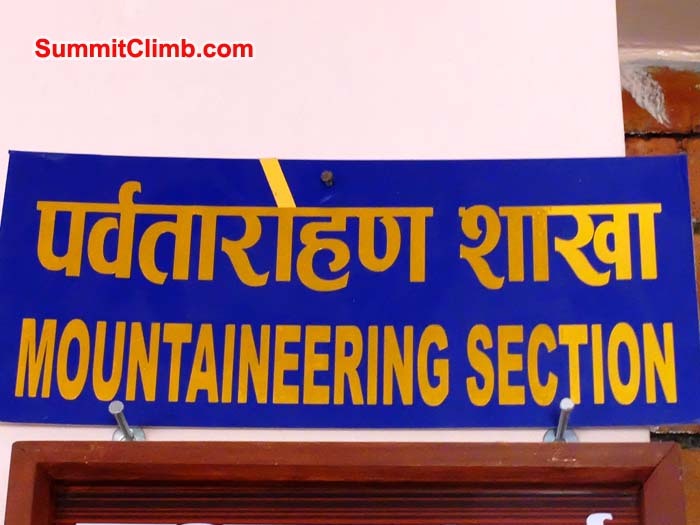 The sign of the Mountaineering Department of Nepal. Here all of the big decisions about Everest, Lhotse, the Camp 3 Training Climb, Everest Glacier School, and Island Peak are made. 6 Feb - Today's Update from Leader Dan Mazur : Everest, North Col, Lhakpa Ri, ABC Trek, Cho Oyu, Shishapangma SummitClimb meets with China Tibet Mountaineering Association CTMA. 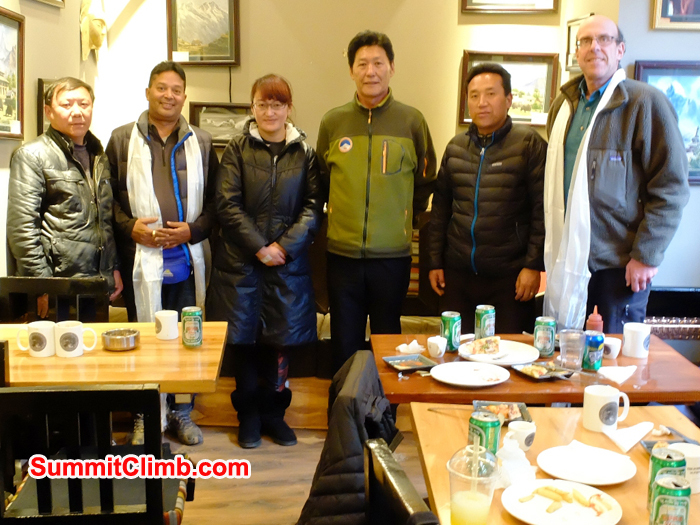 SummitClimb Team meets China Tibet Mountaineering Association - CTMA. Logo of the China Tibet Mountaineering Association. 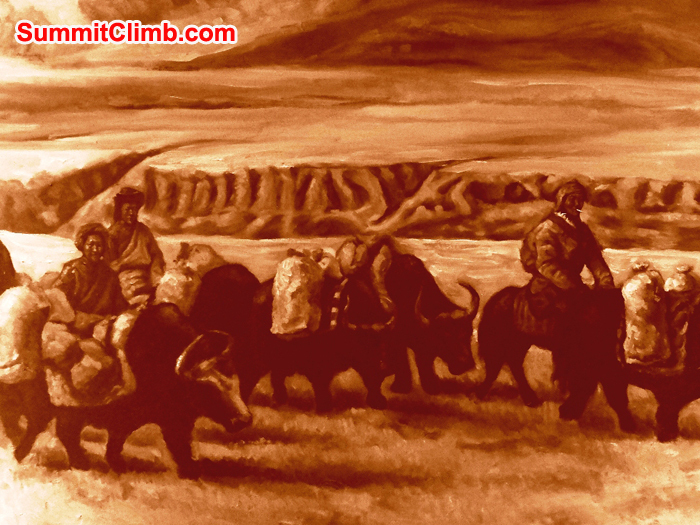 5 Feb - Today's Update from Leader Dan Mazur : Crossing ‪‎Tibetan‬ Plateau by comfortable jeep. After many days @ ‪‎altitude‬, hot shower, delicious food, soft bed. ‪‎Lhasa‬! Impressive bathroom in Shigatse hotel room. Freight train whisks along an elevated concrete railway traversing the plateau from Lhasa to Shigatse. Lovely Yak studded valley on the drive out to the Tibetan Plateau. Murari Sharma relaxing in comfortable Shigatse hotel room. Murari Sharma holding emergency oxygen hood in Shigatse hotel room. Yak skin boats propped up on side of the Yarlung Tsampo river. Photo by Murari Sharma. Its just a few hours drive from our Everest storeroom to Base Camp. Tenji on lower right, Norbu's car on lower left. Memorial to Marco Siffredi in base camp. Boardman and Tasker memorial in base camp. Yaks and dogs enjoy the car park at the Rongbuk Monastery. Monks in the Rongbuk Monastery carving butter sculptures. Padmasambava and some of the famous lamas of the Rongbuk Monastery. 3 Feb: Today's Update from Leader Dan Mazur : ‪Everest‬ ‪Tibet‬ ‪Summit‬ ‪Climb‬ storage check with 10 staff. 2 trucks oxygen, food, tents, rope. ‪‎Expedition‬ 7 April. Ready! Goats in the village where our Everest store is. Horses graze while we check the Everest stores. After checking all of that gear, a big plate of boiled potatoes being enjoyed by Tenji Sherpa = 10 Everest Summits!. Local kids watching the action. Invited into the home of our Everest storeroom owners. 2 Feb: Today's Update from Leader Dan Mazur : I'm in Tibet checking ‪‎Summit‬ Climb's ‪‎Cho‬ Oyu & ‪Shishapangma‬ storeroom. Ready for 2016 expeditions. Sunny. Amazing views! Chewang and Tenji checking all Cho and Shish tents. Chimi and Dolma repairing a basecamp tent in SummitClimb Cho Oyu and Shishapangma storeroom. Dolma shows us how Tibetans use computers while Murari looks on. Chimi and Dorje in SummitClimb Cho Oyu and Shishapangma storeroom. Locals enjoy the hot springs where our Cho Shish store is located. Painting of Everest and Rongbuk Monastery on the wall in Ha Hoo Hotel Tingri. Day begins with fresh homemade bread. Murari, Dorje, and Tenji Sherpa in Tingri, Tibet with RAB jackets and 3 lamas. walk behind the one main street of Tingri to see the Tibetan plateau dotted with sheep. Typical Tingri street scene. One of the infamous street dogs of Tingri. Norbu, Chewang, and Tenji discuss plans for 2016 Everest Base Camp logistics. Murari, SummitClimb manager, ordering expedition supplies while Tingri locals advise. Murar, Tenji, and Dorje and Tingri locals our plans for going to Everest Base Camp, known locally as Qomolangma. Courtyard of our Tingri hotel seen through gate with mountains behind. Best restaurant in town! Elaborate incense burner in Shigatse. Tingri boy in doorway with broom. Local man watches the action carefully. 31 Jan: Today's Update from Leader Dan Mazur : Visit China Tibet mountain office. Impressive! Bird watching. Wind storm. Expedition food shopping. 5 star hotel. Logo of the China Tibet Mountain Team. Monastery above Yarung Tsampo river. Our staff ordering food for Everest, Cho Oyu, and Shishapangma in Shigatse. Rare Tibetan Black Cranes taking off. Summit Cimb Staff at Tibet Everest 50th Anniversary Statue. 30 Jan: Today's Update from Leader Dan Mazur : After much needed coffee busy day sorting ‪‎Everest‬ ‪Expedition‬ supplies for ‪‎climbing‬. Temple visits, official dinner. Potala Palace on a bright winter day. Photo Murari. Our Sherpas share an important Everest planning meal with officials in Lhasa. Busy prayer ceremony in front of Jokhang Temple, Lhasa. City of Lhasa seen from the Potala Palace. Car park at the Lhasa, Tibet airport. Everest Spring 2016 planning meeting with officials at Lhasa restaurant. Golden deer and wheel of life on a sunny winter day in Lhasa. Potala Palace in Lhasa on a beautiful day. Walking into the Potala Palace. Memorial celebrating the first ascent of Everest at a traffic intersection in Lhasa. Fabulous nightlife of Lhasa. Our Lhasa staff sorting out Everest telecommunications in Lhasa telephone office. Today's Update from Leader Dan Mazur : We flew to Lhasa, Tibet. An amazing mountain flight between the summits of Everest, Makalu, and Kangch. Breathtaking! Dry Valleys of Tibet, seen from the Kathmandu - Lhasa flight. Mighty Kangchenjunga, world's 3rd highest, seen from our fly-by on the flight to Lhasa. Today's Update from Leader Dan Mazur : We visited Nepal Mountaineering Department today. Everest is 100% open. Free permits for 2015 earthquake members!